Prefab Homes Mentioned in Design * Sponge! 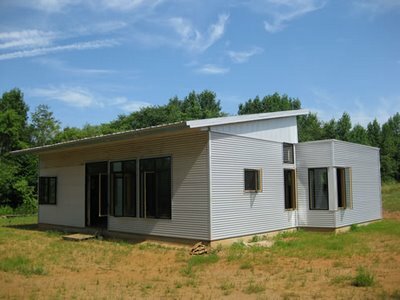 Itchin' for Prefab Off Grid House Kit Completion! "Design*Sponge is a daily website dedicated to home and product design run by Brooklyn-based writer, Grace Bonney. Launched in August of 2004, Design*Sponge was declared a “Martha Stewart Living for the Millennials” (NY Times, 2008) and features store and product reviews, city, product, and gift guides, diy projects, before & after furniture and home makeovers, home tours, recipes, videos and podcasts, and trend forecasting." We hope you all have been enjoying your summer. Here, hedges are filled with blackberries, the children are barefoot chasing chickens, dogs lounge hotly against cooler floors, and we are hard at work to offer you affordable, prefab house kits. Ron is busy framing the interior, and we will check on his progress this weekend. It has been a frustrating week for him- his generator (don't forget he's building the house kit off grid) died last week, was a few days in the shop for repairs, then, after dragging it out to the land, broke again Monday. We ended up going ahead and buying our own generator at that point, as we will need it anyway for our off grid systems back up. I am looking forward to visiting this weekend and seeing the changes in the prefab house! YAY, i love Design Sponge!